Loudon, NH, September 23, 2018 – Marc-Antoine Camirand came very close to another podium-finish, on Saturday at the New Hampshire Motor Speedway, but he ran out of fuel with half a lap remaining in the race. The GM Paillé N°22 Chevrolet Camaro was fast all weekend, for the first NASCAR Pinty’s race in the US. The New Hampshire Motor Speedway mile was a completely new track for Marc-Antoine Camirand, but he showed that he could be quick right at the beginning. He posted the fastest time in the final practice, with a blistering lap of 31,936 sec. He qualified the GM Paillé N°22 Chevrolet Camaro in 6th place and he knew he could climb back positions quickly in the 100-lap race. “Qualifying is all about pure speed, but we chose to sacrifice a few positions on the grid to have a better car on the long run. It paid off. My GM Paillé N°22 Chevrolet Camaro was so fast in the race, I knew I could achieve another great result,” said Camirand after the Visit New Hampshire 100. The driver from St-Léonard-d’Aston, QC, was patient at the beginning of the race, trying to preserve his tires. “We were running the entire race on the same tires, and I knew I would have to finish strong. I climbed up to the second spot, and at the end of the race, I was catching up on the leader”, he explained. At the very last lap, the GM Paillé N°22 Chevrolet Camaro ran out of fuel. “The leader was trying to save gas, and I could have done the same. I wasn’t expecting to be short on fuel. Some of the other drivers went to pit on a yellow for adjustments on their cars and took gas at the same time. I didn’t pit because my car was driving very well, and I thought I could run the 100 laps without any problem”, commented Camirand. The driver was disappointed to miss a podium-finish by half a lap, especially when the field ran a few laps on yellow that didn’t count. “There was a caution flag before the first lap had been completed, and the laps on yellow didn’t count. If it weren’t for that, I would have finished the race and kept my second place”, he explained. 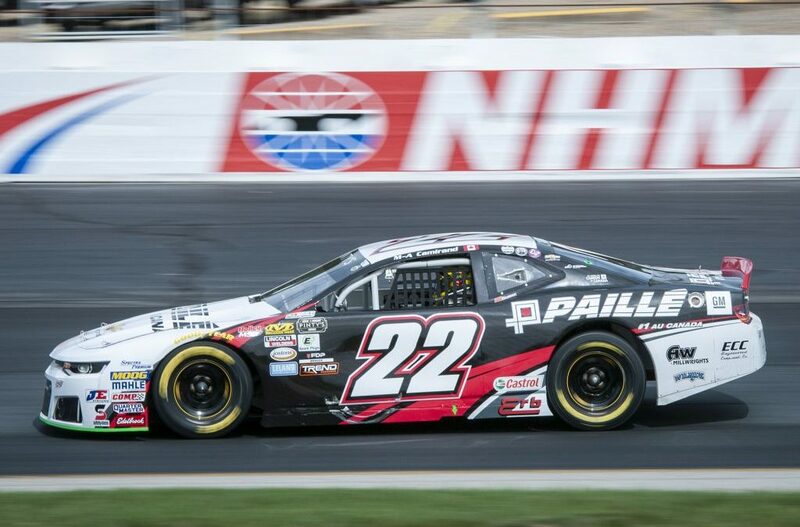 Marc-Antoine Camirand hope to have a strong season finale at the wheel of the GM Paillé N°22 Chevrolet Camaro, next week, as the NASCAR Pinty’s series will be on track at the Jukasa Motor Speedway, in Hamilton, ON, for the Pinty’s Fall Brawl.